According to the Quarterly Census of Employment and Wages, the 10 largest employers in the state of North Carolina are universities, hospitals, public schools, and banks. 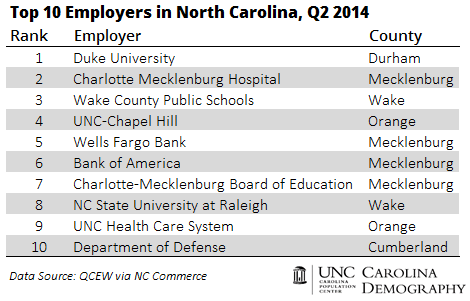 Duke University in Durham was the state’s largest employer in the 2nd Quarter of 2014, followed by Charlotte Mecklenburg Hospital and Wake County Public Schools. The Triangle’s other major research institutions—UNC-Chapel Hill and NC State University—were the 4th and 8th largest employers in the state, respectively. Four of the 10 largest employers in the state were in Mecklenburg County, two were in Wake, two were in Orange, and one was in each of Durham and Cumberland counties. County by county, who was the largest employer in each of North Carolina’s 100 counties in 2014 (Q2)? Across the state, public school systems are frequently the largest employer. Public schools were the largest employer in 59 of the state’s counties. These include districts with well over 1,000 employees (e.g., Wake, Johnston, and Franklin counties) to those with between 100-249 employees (Clay, Tyrrell, and Yancey). From furniture manufacturing in Graham to medical device manufacturing in Nash, employers in the manufacturing industry were the top employers in 11 counties. In five counties, the top employer was in the food industry: Bertie (Perdue), Bladen (Smithfield), Duplin (Butterball), Sampson (Smithfield), and Wilkes (Tyson). The top employer in three counties was involved in medical or health-related manufacturing: American Emergency Vehicles in Ashe, Baxter Healthcare in McDowell, and Hospira in Nash. Hospitals or medical services (e.g., Labcorp in Alamance County) were the leading employers in 11 of the state’s counties. Public administration was the leading employer in 8 of the state’s counties. The Department of Public Safety was the leading employer in Anson, Avery, Greene, and Hyde. The North Carolina Department of Health & Human Services was the top employer in Burke and Granville. Meanwhile, the City of Rocky Mount provides the most jobs in Edgecombe and the local Human Resources/Employment department was the leading employer in Swain. North Carolina’s universities are major employers in multiple counties. Duke University was the leading employer in Durham County. Three UNC system schools—UNC-Chapel Hill in Orange County, Appalachian State University in Watauga, and Western Carolina University in Jackson—were the leading employer in their counties. The military has a significant presence in North Carolina, and the Department of Defense was the leading employer in 3 counties: Craven (Cherry Point), Cumberland (Fort Bragg), and Onslow (Camp Lejeune). Lowe’s was the leading employer in Iredell and Northampton Counties, the YMCA was the leading employer in Pamlico, and BB&T was the top employer in Wilson. Download and explore the data at NC Commerce’s Labor & Economic Analysis Division’s Demand Driven Data Delivery System. This entry was posted in Carolina Economic Data, Fun Maps and tagged county, industry, largest employer, NC Commerce, QCEW. Bookmark the permalink.